Some people believe that cats can be bad for pregnant women. This is a mistake. The belief stems from concerns about toxoplasmosis, a micro-organism that can affect the foetus if a pregnant woman is infected. However, a major study in the British Medical Journal concluded that contact with cats was not a significant risk factor for infection with toxoplasma. Pregnant women should wear disposable gloves and an apron when cleaning litter trays- or get someone else to do this. Increasing the number of tray cleans to twice daily would also reduce the possibility of spores developing from infected faeces. 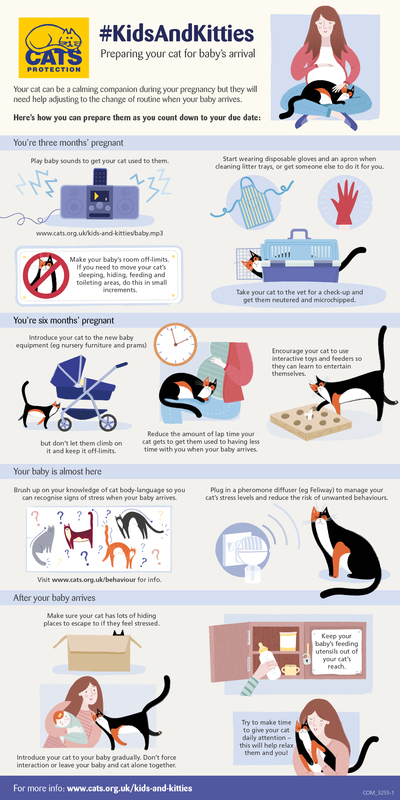 The below image and this video serve as a guide for preparing your cat for a baby’s arrival. We have free downloadable MP3s of baby sounds, and also some tips to use them effectively. Try to save a little time to give your cat attention daily. As always, if you have concerns or worries call us on 0141 779 3341 or email Glasgow@cats.org.uk.